The Norwegian economy has been declining due to the crisis in the oil and gas sector. This results in continuous rounds of layoffs, which has not been shocking news in the media. However, according to two experts from NAV named Kamilla Brunvoll and Tove M. Gustad, jobs disappearing in the oil and gas sector have been creating jobs in other sectors. Some companies have appreciated this situation because they can attract talents from the oil and gas industry. Tourism is booming so there are many opportunities for students to find summer jobs in this sector. The northern areas in Norway, such as Nordland, are still hiring. Therefore, new graduates should not be too negative about the job market in Norway. First, students should keep themselves updated with the news in order to quickly seek out companies who are requiring new labour. For example, if you see that a company is going to open new branches/departments, it means that it will employ more in the near future. On the other hand, if a company is in downturn, it is not a wise choice to contact them. Second, students should tailor CV for each job. Putting some time and effort into tailoring will make your CV outstanding from a pool of applications, because the employers can easily recognize the level of interests that candidates have in their job offer through the applicants’ CV. There is no place for the word «laziness» here when you want to have a good job. Third, on the career day next week (3/2), HiMolde students should take some time to research the companies they are interested in and prepare questions to ask company representatives. This can help job-seekers to impress employers. Most importantly, don’t approach employers by only telling about yourselves, your achievements and so on. It will be more effective to impress employers by having two-way communication. 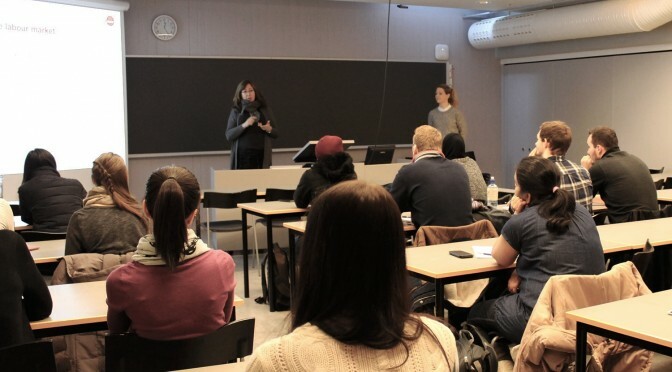 For more advice on CV writing, Kamila and Tove will be on campus for career day, and they welcome students to pass by their stand.